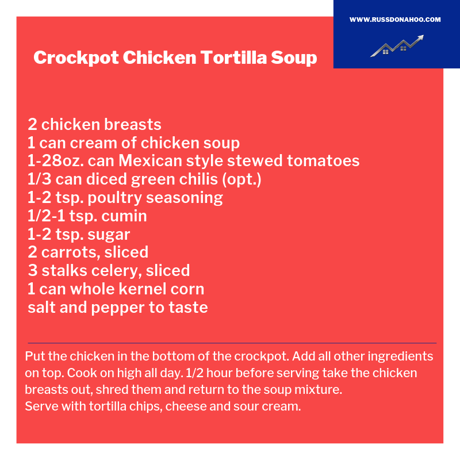 Do you have any recipes you would like to share with us that we can feature here on the blog and in our monthly newsletter? I grew up in the printing industry. My parents opened their print shop when I was 7 years old. As a child we would help out with bindery summers and after school. After high school, I stayed working at the print shop. My parents decided to sell the business, but I was kept on as an employee with the new owners. In 2002 I left that shop and worked for 2 other print shops in the area for several years. In 2009 I decided to try it on my own. I started out in my living room of my house and grew the business by word of mouth. In 2013, I purchased another shop in town and combined it with my business to become Color Keys Printing. I have grown and morphed into my current services and moved the business into a shop on our property. Color Keys printing is a smaller, digital printing shop. Paper printing is the main service (letterhead, brochures, carbonless forms, envelopes, invitations, notepads, basically anything printed on paper). I also am a self taught graphic designer and can design projects as well as print from customer provided files. I provide vinyl lettering and mailing services. I added a large format printer in 2014 to allow full color, large giclee canvas and matte prints for both commercial and personal use. Color Keys is not just a commercial printer. I love working on projects on a personal level as well. I am very grateful for my many wonderful clients, and their recommendations to people they know and come in contact with. I love what I do, and hope to keep growing in the years to come. We have truly enjoyed our interactions with Color Keys. Her customer service is fantastic. Janna is always willing to help us get exactly what we envision; our business cards are superb. Contact Janna for all your noncommercial printing needs!! A note from Interwest Mortgage lender, Jason Speirs: “I started my career as a mortgage loan officer just over 20 years ago when the 30 year fixed conventional interest rate was approximately 7%. Prior to that time frame the 30 year fixed rate was as high as 18%! Ouch!!! Home buyers the past several years have been able to enjoy VERY low interest rates. The average rate in 2016 was approximately 3.5%, the average in 2017 was approximately 4%, and last year’s average rate was approximately 4.5%. As you can see, although rates are still very low, they are definitely on the rise. In just two years we have seen a 1% increase, and leading economists expect these increases to continue. How does a 1% increase impact a home buyer? The difference between 4.5% and 3.5% on a $200,000 loan is a payment increase of $115 per month! How does a 1% increase impact buying power? If a buyer in 2018 wanted to have the same payment as a buyer in 2016, the loan amount would have to be $22,752 less! What thoughts do you have about this information? 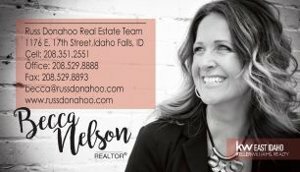 Comment below or send me an email (russ@russdonahoo.com) or a text (208.243.0545) with any questions. What do these numbers mean? One of the most significant observations is the lack of inventory. How does low inventory effect the market? It is simply supply and demand. When the supply is low, often competition for houses increases and demand can spike. This is reflected in the “Average Days on Market”. If we compare January 2016 (79 days) to January 2019 (52 days), it is easy to see that the average days on market has become shorter. As supply went down and demand rose, so did the average sales price. Home sale prices have jumped roughly 17% from 2016 to 2019. For example, if you purchased your home in 2016 for $150,000, today your home value would be approximately $175,500. There are certainly many factors that may increase or decrease your homes sales price. I am happy to discuss with you how these factors may apply to your home. We are excited to be in the real estate world and are passionate about helping you with your real estate needs. Now is a great time to list your home or investment property because of the low inventory levels. A common misconception among sellers is to wait until summer to list their home. Because of the current low supply of homes on the market, it may be beneficial to list your home now, instead of waiting for the summer months. Most importantly, we encourage you to list your home when the timing is right for you. We are always here to help you negotiate the best outcome in your real estate transactions. How do these numbers look to you? Comment here or send me an email (russ@russdonahoo.com) or text message (208.243.0545) with any questions. Today we would like to take a minute and spotlight a local business we have heard great things about; Noah's Lawn Care! Love looking at the fall leaves, but tired of tracking them into your house? Do you find yourself dreading the thought of standing out in the brisk autumn air attempting to put wet, soggy leaves in a garbage bag just to have the bag blow away or fall over and all your work be for nothing? Let Noah's Lawn Care clean up those annoying fallen leaves by mowing and bagging them, then hauling them away for you. 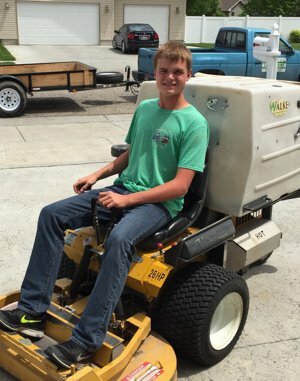 Noah's Lawn Care is a locally owned and operated business in Idaho Falls, ID. 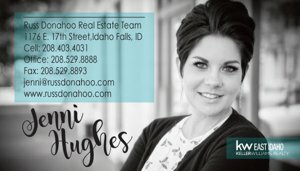 The owner, Noah Brown, has been an Idaho resident for over 10 years. He started his business in high school and has kept it running since. Since starting his business, Noah has continued to enhance his knowledge, experience, and reputation over the years. 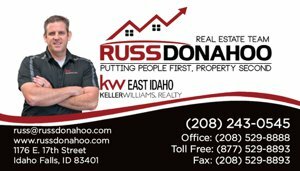 He looks forward to the opportunity to help make Idaho Falls a more beautiful place to live, one yard at a time! 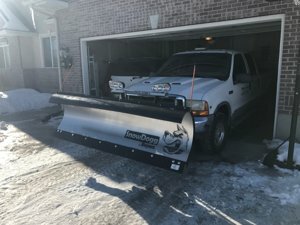 Check out Noah's Lawn Care services (noahslawncareif.com) and let us know about your experience! Halloween is right around the corner and the community is gearing up to treat everyone. Many free events are starting this weekend! Remember those pumpkins we gave away at the beginning of the month? We want to see what creations you have made with them! There are a few pumpkins still left in the office for those that might need a few. Post your carved pumpkins on Facebook and/or Instagram and tag us to be entered to win a pizza dinner from Papa Murphy's. If all else fails, email us (tnt@russdonahoo.com) a picture of your pumpkins and we will enter you. Becca shares some advice when faced with a bidding war. TIP TUESDAY...but on a Thursday! Is your home the shiny apple?